The majority of our milling is performed with a Wood-Mizer band-saw mill, capable of sawing a 30" diameter by 21' long log. This helps us maximize the amount and quality of lumber we can achieve from a log. Boards and slabs can be milled up to 24" wide. 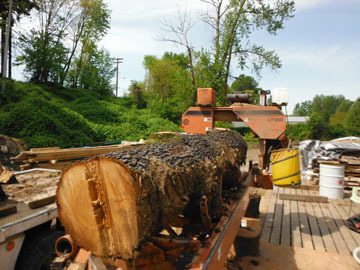 Logs over 30" can be reduced in size with our chainsaw mill prior to band-saw milling. We can mill up to 200 bf per hour, depending on log size, hardness, and board thickness. Call for a quote on your next milling project. We will be happy to help. Please note: We are no longer portable. If you would like a sawyer to mill on-site contact Wood-Mizer for a list of portable sawmills in your area. Log Hauling: "Bluford Dyno Boomer"
Our knuckle boom crane truck is a salvaging beast. Lifting capacity of 8,000 pounds. 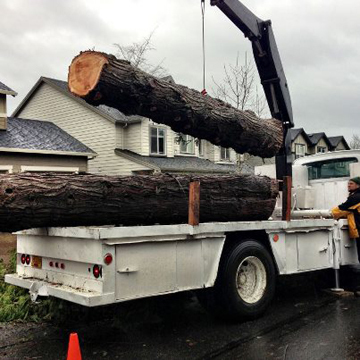 Examples: A 36" diameter fir log x 20' long, 46" maple log 10' long, and a 42" diameter x 11' long white oak. 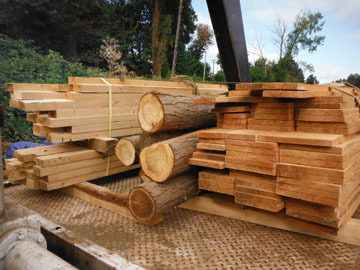 Custom milled softwoods, including fir, cedar, and sequoia redwood, for decking, siding, post and beam timbers, and fencing. Sawing hardwood live edge slabs, book-matched sets, dimensional lumber, and mantles. Re-sawing reclaimed beams and lumber up to 24" wide by 21' long. Customer logs that contain nails or any other embedded objects that damage saw blades are charged $25.00 to replace.